When it comes to computer attacks, there’s a not-so-new villain in the cyber world. Ransomware is the fastest growing malware, which is malicious software intended to damage or disable computers. Ransomware is affecting technology companies, banking institutions, government organizations and even individuals. Even though this sophisticated malware is about 30 years old, the number of attacks grew by more than 50 percent last year compared to 2015, according to Carbon Black Inc.
As the name suggests, ransomware takes control of the data in the computer, injects a code (encrypts it) and demands the victim to pay a ransom to regain access to files in his or her computer. If the money is not paid in a certain period, the data is lost forever. “Although this ransomware is affecting mostly organizations, individuals are not exempt of being affected as well, so it is important to take some actions to keep your personal data safe,” says Camilo Ruiz, network security analyst at Dupaco Community Credit Union. Phase 1: The attacker sends a spam email, and the user clicks on a malicious link. Phase 2: Malware runs in the computer, and it encrypts the computer’s files. Phase 3: A ransom note is delivered, and the attack attempts to spread to other computers. “There is not much that can be done if you are a victim of a ransomware attack and you do not have a recent backup created that can be restored,” Ruiz says. If you decide to pay the ransom, know that you might not regain access to your data. “There is not 100-percent certainty you will receive the key to free your data, and then you would lose your data and your money,” Ruiz says. Get—and update—security software. If you don’t have security software on your computer, install it. Then, continue to update it. Anti-virus and malware detection companies regularly release updates to help keep your computer protected from the latest known risks. Delete any unknown email. 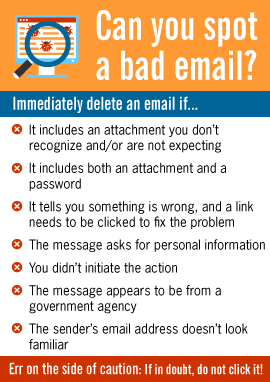 If you receive an email that appears to be spam, delete it immediately, and never open an unknown attachment.